The Ford P100 pick up seems to be making a bit of a comeback around Essex. A few years ago, if we were asked if we sold new spares for the P100 then we would have been honest and said not really. Now though, we are needing to buy more and more of the items that drivers of the Ford P100 pickup want in, as the demand is certainly increasing. But what parts and spares can we supply you are probably wanting to know. Well it’s difficult to be specific, or this page will run to hundreds of words. But the list of new parts and spares shown at the bottom will give you a good idea of the items we can supply not just for the Ford P100 pickup, but for all makes and models of vehicles. The Ford P100 Has gone through many different versions over the last 40 years. First made in South Africa in 1971, its body closely resembled the MK3 Ford Cortina. And it stayed closely related to this classic British motor until it moved to Europe in 1982, and the chassis moved onto the Sierra type of bodywork. The list below are the models of the Ford P100 that we can get parts and spares for although if you would prefer to use a breakers for your parts then feel free to use the information on our breakers page. If you go through to our online store you will have at your finger tips over 150,000 tools, parts, spares, valeting items, and even caravan equipment. All ready to be ordered online and then delivered to our premises in Basildon for collection when its convenient to you. So no more wasted Saturdays driving around Essex in your Ford P100 trying to find some brake pads or an exhaust part for your vehicle. Order it online and then you know that you will get the job done easily. And more often than not, our suppliers will give you the best prices they can too. Right This Sounds Ok But What P100 Parts Do You Sell? Well, we will have to be honest as there will be parts for your Ford P100 that we can't get. For example a main dealers part will always be a main dealers part. We can buy it in for you, but the price will be the same as you can get. However its the harder to find stuff that we have really made our name over the last quarter of a century. The list below shows the parts that we can get not just for your Ford P100 Pickup, but for all makes and models of cars that you can see in Essex today. Do You Deliver Ford P100 Parts To Your Customers? At the moment we don't offer a delivery service as we just aren't big enough to be able to cope with it. We are a family owned business that has built our name focusing in on our face to face customers, and incoming phone calls. These are the areas that we think we are best at and therefore providing the type of service that our customers want too. So although it might be wonderful to have your P100 parts whizzing their way to you, alas it's not going to happen. 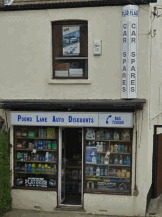 But of course you can book your parts online and therefore they will definitely be waiting for you when your arrive. Right I'm Coming To You...Where Are You Exactly? Well we are in a great position for you to get to us quickly. And we really mean that. As you can see from the map below we sit central to the three main routes through Essex. The A127, A13 and A130 all run about two minutes away from us, which means it will only take about 20 minutes for you to get the best P100 parts around. For more information as to our exact location you can check our page on directions here. Or use the link below the image and enter your postcode for step by step driving instructions.